Glasgow City Council’s latest proposals for a Low Emission Zone have been labelled as “incoherent, ill-considered and unworkable” ahead of the zone’s planned introduction at the start of next year. 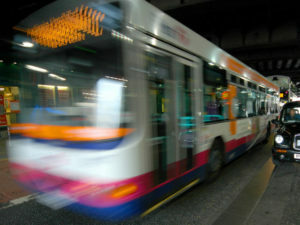 Glasgow’s LEZ will initially target just buses. The city is to become the first of four in Scotland to introduce LEZs by 2020 to help cut pollution. A meeting last autumn saw the City Administration Committee agree to a set of proposals covering an initial phase that would target buses – said to have the biggest impact – followed by a second phase covering cars, vans, trucks, taxis and motorbikes at an unannounced date. Criteria for diesel is Euro 6 and Euro 4 for petrol vehicles. A latest update on the proposal – due to go before councillors next week – shows the city is still progressing with these plans after interaction with bus operators and has announced that the first phase of the LEZ, covering the city centre, is due to come into effect from 1 January 2019. The council has also confirmed all vehicles entering the zone will need to fully compliant by 31 December 2022. Other work has seen the establishment of an LEZ Delivery Forum to engage with fleet operators and the wider business community, and individual meetings with industry trade bodies and representative groups in relation to the second phase of the LEZ, helping to ensure that everyone is aware of and prepared for it. Commenting on the latest update, Councillor Anna Richardson, City Convener for Sustainability and Carbon Reduction, said: “Glasgow’s LEZ will be the first of its kind in Scotland and has been modelled as being capable of making significant reductions in levels of air pollution in the city centre. However, ClientEarth slammed the proposals. Clean air lawyer Anna Heslop said: “The point of a Low Emission Zone is to bring pollution levels within legal limits and this plan, as currently envisaged, is incoherent, ill-considered, and unworkable. “Scotland is obliged to bring down pollution levels as soon as possible and the Scottish Government must make sure that the schemes put in place in the worst polluted towns and cities do just that. If this is what the first scheme looks like, then there is little hope for the rest of the country. Earlier this week, Transport Scotland published results from a public consultation that saw overwhelming support from businesses and the public over future implementation of Low Emission Zones.